Life, liberty and the pursuit of happiness. That is what we celebrate this weekend. How free do you really feel with a mountain of debt and monthly payments that keep you from doing what makes you happy? Are you sick and tired of going to a job you hate? Tired of worrying about how you will pay your bills next week? Enough is enough. There is more to life than living paycheck-to-paycheck. There is more to life than sending your hard earned money to a bank each month. 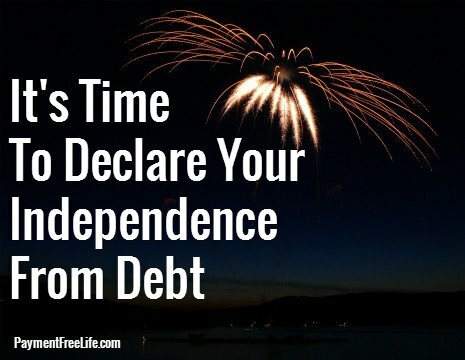 It’s time to declare your independence from debt. It’s time to get on a plan and get it all paid off. Vow to never again spend more than you make. You can’t win with money if you are spending more than you bring in. Create a spending plan. You don’t have to wait until the beginning of August. Start with your next paycheck. You can use my 28 day budget to guide you. Curb your lifestyle. The more you are willing to cut, the faster you’ll get out of debt. Cutting back $25 per week on eating out will add an extra $1,200 per year to your debt payoff plan. Cancelling your cable can save you another $1,200 per year. Where can you cut back? Generate extra income. Start a side business, work overtime or get a part-time job. Sell stuff. Have a tag sale, list things on Craig’s List or Ebay. Get mad. Those that are really successful at getting out of debt get MAD. REALLY MAD. Make a list of all your debts and put it on the wall. Shake your fist at it when you see it every day. The angrier we got about the debt the faster we paid it off. This 4th of July vow to change your life. Are you ready to get out of debt? If you are currently paying off your debt, how much debt have you paid off so far? Let’s give some inspiration to those who are just starting.